On the landing at the top of the stairs in Michael and Sally Cookson’s beautiful Cheshire home, one is greeted by a corner space about one and a half metres square. The owners decided a piece of furniture would emphasize this space as an important focal point. One problem with this location is that immediately above the corner is the loft access from which a ladder drops down – so any piece of furniture would have to be avoided by the ladder. Having tried unsuccessfully to place various pieces of furniture in this corner (a chest, a bookcase and a round table), they contacted Jeremy Hall at Peter Hall & Son to see whether he could come up with any suggestions. Michael and Sally had previously commissioned furniture from the company, as well as having had some excellent restoration work done. Not least they admired Jeremy’s designs and thoughts and had every faith in him. Also being fascinated by “secrets” in furniture why not incorporate one of these in the cabinet? All in all we had set Jeremy quite a task – however he rose to the challenge and came back with a design with not only one “secret” but three – these being a revolving internal drum and hidden external drawers. After much deliberation on what to include as marquetry items we decided on a wild pond life theme for the inside – this shows a pond with a crested newt on a rock amidst bull rushes and a dragonfly hovering above. The outside shows the wild honeysuckle which twines itself around the piece as it does in the hedgerows. Discretely hidden on the outside are two small ladybirds and a butterfly. It gave us great pleasure in following the creation of this masterpiece and seeing the fine workmanship that has gone into it. The finished cabinet far exceeded our expectations and gives us great pleasure whenever we look at it. No finer piece of furniture could have graced this difficult corner. Peter Hall & Son richly deserve the Worshipful Company of Furniture Makers Guild Mark (No. 348) they received in 2004. “To make a piece of furniture to fit into a space in a corner at the top of the client’s stairs,” which was under access to roof space and a pull down ladder. The client wanted us to use English hardwoods to incorporate a secret compartment and to have a contemporary feel. The rest was up to our imagination. We decided a floor standing corner cabinet seemed a good idea for the space. The design has a curved frontage and door, features a central vertical cylinder which, when revolved 180 degrees shows a different face. This is mounted on two roller bearings and is made up of laminated MDF sheets, which were turned to form the cylinder, then veneered. MDF was chosen due to its stability, there being no room for movement where the sides of the cylinder met the static parts. The design also features two discreet drawers between the legs under the top. These also have a simple mechanism. The inside of the cylinder was veneered with Ripple Sycamore. The outside used Burr Walnut and featured marquetry, which Jeremy preferred to have an organic feel rather than geometric repeats. 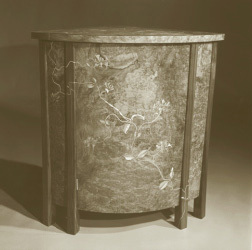 This was achieved by meandering honeysuckle climbing up a leg and passing through to the inside of the cabinet, the idea coming from the plant growing in the client’s hedgerow beside his drive. The stem of the honeysuckle was inlaid into the solid leg. Two ladybirds and a blue butterfly are hidden amongst it. The natural theme continues on the inside, which takes its inspiration from a pond in the client’s garden. This shows bulrushes, reeds, a newt and a damselfly. This commission achieved two important things for Peter Hall & Son. It enabled us to discover new ideas and techniques, which took us on to new ideas that have been developed into subsequent pieces. The gaining of the Guild Mark is something of which we’re very proud. Peter Hall and Son Ltd was set up by Peter Hall in 1972. As a former aeronautical engineer, Peter had the precision skills necessary for cabinet making. Reading the book ‘Small is Beautiful’ by Schumacher was a pivotal point in his life. It was concerned with the ethos of Britain being a nation of small businesses and opened his eyes to the possibility of following a different lifestyle. Around this time, his son Jeremy was also training in furniture making and design at Leeds College of Art. He then went on to work in the field in Yorkshire for three years. Realising he wanted to widen his experience he gained a place at West Dean College to study furniture conservation. The company prefers to buy trees locally. Where possible, buying them in the round and quartering them at local sawmills, then laying up to air dry in a draughty drying shed for up to eight years, finishing the process in the dehumidifying kiln. In this way the company has been able to ensure the maintenance of quality and consistency of timber by using wood from one tree. Gradually Jeremy’s role in the business has evolved to that of designer and director. He now has a team of 17 staff working with him. Jeremy believes wholeheartedly in apprenticeship schemes. He feels it is very important that companies like his continue to offer apprenticeships and that young people are encouraged to take and value a more practical career rather than automatically be guided to follow the academic route to university/college. In keeping with WH’s core philosophy, the Cooksons decided to plant Walnut trees on their farm. Having successfully re-designed their landscape and planted many hundreds of hardwoods, they asked us to source high quality Black Walnuts. WH revisited their Suffolk tree nursery to produce some exceptional plants which had been raised from seed, taken from four massive Black Walnuts which have been growing for more than 200 years near Fakenham in Norfolk. Last summer’s severe drought was a worrying time for the Cooksons, but we are pleased to report that the trees are now doing very well. Newer PostMulberry Burr versus "Stained Burr Maple" - The Debate Continues!